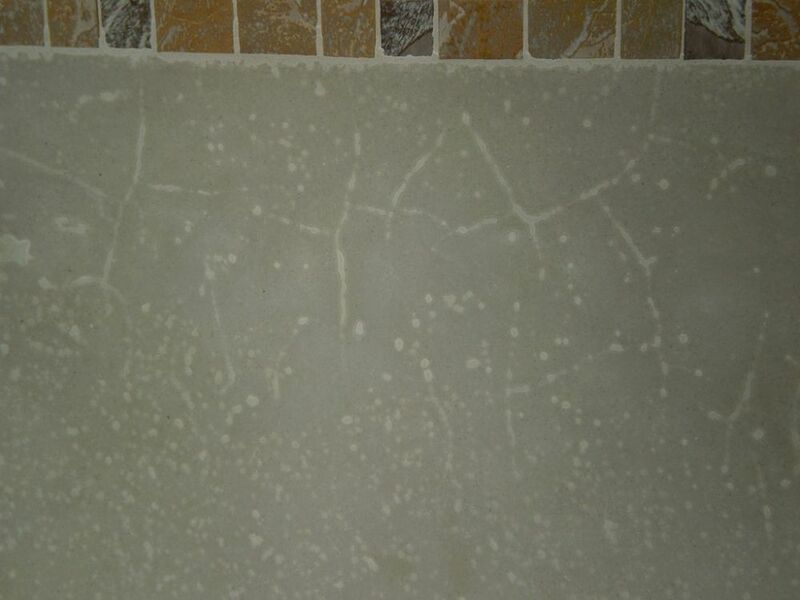 Five years ago, Kim Skinner wrote about what was involved in making pool plaster durable. A lot has come to light and been studied and evaluated since then, he says -- more than enough to warrant preparation of a detailed, side-by-side update on the subject. In December 2010, WaterShapes published “How to Make Durable Pool Plaster,” an article filled with what I knew about making reliable, discoloration-free pool plaster – including basic information about both proper and improper plastering practices. It should come as no surprise that, since then, research has continued and our understanding of issues involved in the proper mixing and application of these cementitious finishes has continued to grow. This article will cover these developments, discussing in greater detail the science and mechanisms of how and why pool plaster fails (that is, the causes of surface weaknesses and discolorations) and, more important, what is required to produce long-lasting, durable, and aesthetically pleasing pool finishes – quartz and pebble surfaces as well as plaster. To avoid the necessity of referring back to the original article mentioned above, the new information and observations will be presented here along with relevant excerpts from the original text. To make the distinction obvious, the older text will appear in blue, with the new text in black. Let me begin by restating a point made nearly five years ago: Those of us who work with cementitious finishes for pools, spas and other watershapes do not operate in a vacuum: Known principles of concrete/cement science apply to what we do, and by recognizing this fact, we can confidently offer basic practices that reliably result in the creation of durable plaster. It all makes sense: Both plaster and concrete contain Portland cement (gray or white) as a main component, and it is this cement component of the mix that is affected (either favorably or unfavorably) by various additives to that mix and by workmanship practices observed on site. 1] The best cement-to-aggregate ratio is about 1 part cement to 1.5 to 1.75 parts aggregate (marble sand), with quartz finishes being a little richer in cement. This ratio results in a higher-quality pool plaster finish than either richer (more cement) or leaner (more sand) mixes. Plaster that is too rich tends to shrink and crack, while plaster that is too lean is unworkable and isn’t durable. Further, the cement and aggregate (and admixtures, for that matter) should be selected with care: All need to be of good quality and consistency and of an appropriate grade for use in pool plaster. 2] A water-to-cement ratio of .48 or less is best when mixing plaster. The American Concrete Institute (ACI) and the Portland Cement Association (PCA) have established that lower water-to-cement ratios (that is, less than .50) yield better quality cement that can resist occasional exposure to mild acids. Following a recommendation by the American Concrete Institute (ACI), we now advocate using a lower water/cement ratio of .45 to produce better-quality cement that will withstand exposure to water, including occasional aggressive water. This means adding 5.1 gallons of water for every 94-pound bag of cement (and does not factor in the aggregate content). This point is supported by studies conducted using the National Plasterers Council’s (NPC) research pools at California State Polytechnic University (Cal Poly) in San Luis Obispo. They show that a water-to-cement ratio of .46 produces better results (that is, less deterioration and discoloration) than does a water-to-cement ratio of .50. 3] Lower water-to-cement ratios also increase density and reduce permeability, porosity, shrinkage (craze cracking) and movement of water within the cement product, while higher water-to-cement ratios can result in a finished product that does not offer adequate protection or long-term durability against the natural effects of water and the environment. Pool plaster is constantly submerged in water, so there is a distinct need to produce a less permeable cementitious surface. This is accomplished by reducing the amount of mixing water to an extent even greater than we recommended previously. 4] Plaster should contain as little calcium chloride set-accelerant as possible – and never more than two percent of the amount of white cement. (Colored plaster, of course, should not contain any calcium chloride.) It has been documented by PCA and cement researchers that using more than this amount increases the chances of gray discoloration, mottling and cement shrinkage. Helpfully, alternatives to calcium chloride that lack this downside potential are available. Calcium chloride is still used by many plasterers despite the fact it is known to cause excess shrinkage, micro-cracking and reduced durability as well as the graying of white cement. Indeed, the Cal Poly studies cited above indicate that when calcium chloride is applied at a 3-plus percent level in the plaster mix, severe cracking results. Studies have also shown that calcium chloride levels of less than 2 percent can still cause or contribute to mottling or spotting discolorations. Given all this, if a set-accelerating additive is needed, we advise using it at a level of less than 1 percent. Decisions about the amount of calcium chloride to use as a set-accelerant are far from inconsequential: This blemished finish was analyzed by four different cement laboratories, and they concluded that the cause of the graying, cracking and spotting was the fact that the accelerant had been added at an excessively high level – about 3.5 percent – and that the surface had been wet-troweled. And our recommendation is even stronger with colored plaster mixes, which should not contain any quantity at all of calcium chloride as a result of the severe blotching and mottling effects that will occur. This issue has been documented by PCA – and by an NPC study that indicates that adding calcium chloride to only a 1-percent level results in significant discoloration of colored pool plaster. Conclusively, the manufacturers of color pigments declare that their color pigments and calcium chloride are incompatible and should not be used together. Note as well that organic color pigments are to be avoided: Chlorine water treatment can bleach out the color, so it is best to use inorganic pigments. In a business in which several alternatives to calcium chloride are now available, this case should be closed. 5] A plaster mix should be mixed thoroughly, but not for too long. In fact, it is recommended that if the plaster has been mixed for more than 90 minutes, the batch should be discarded. As true today as it was five years ago. 6] Water should not be added to plaster surfaces during troweling because of the strong risk potential. It has been documented by both ACI and PCA that doing so (that is, “skewing the surface water-to-cement ratio”) increases porosity, shrinkage, streaking, spotting and variable discoloration. That said, small amounts of water used for trowel lubrication don‘t seem to have a significant adverse effect on the plaster surface. Most visible problems, which take time to become exposed, require a combination of water finishing, chloride abuse and other improper practices. When working with colored plaster, pigment suppliers advise against using calcium chloride in the mix – which happened in both of the pools illustrated here and resulted in considerable discoloration and mottling. And the error in using the accelerant was compounded in these two cases by wet-troweling, which added streaking to the generally unappealing appearance of the pools. Well-timed hard troweling can help produce a good, dense plaster finish. If, however, the plaster surface has hardened too much before a smooth surface is obtained, PCA has documented that this late hard troweling can cause dark discoloration and color variation, especially when calcium chloride and extra water are also used. These points are all still true, but perhaps need greater emphasis. Water should never be sprinkled onto plaster and troweled into the surface. Both the ACI and PCA have found that this can cause weaknesses, such as increased porosity, shrinkage, cracking and variable discoloration that will usually appear at some point after the pool is filled with water. 7] Plastering in extreme weather conditions can lead to problems. ACI and PCA both mention that applying cement-based products on days or in conditions that are either too cold or too hot will adversely affect both quality and durability. These problems can be avoided by “tenting” the pool, thus protecting the plaster surface (and the plasterers!) from temperature extremes. Tenting a pool in extreme dry and high temperatures, for example -- and perhaps even directing air from an evaporative cooler under the tent – can help the plaster retain its moisture and thereby properly cure and harden. It is an unfortunate fact that plastering in extreme weather conditions can lead to durability and discoloration problems while also making the working lives of plasterers miserable. Extreme cold can prevent the plaster from setting up and hardening in a timely manner; it can also encourage plaster weakness and other defects. On the flip side, extreme heat and low humidity can cause the plaster to dry out quickly and fail to hydrate and harden properly. (High winds can affect plaster in the same way.) When plaster hardens before being troweled to smoothness, any additional troweling can gray or darken the color of white pool plaster. This is a case in which, as a coping mechanism, plasterers will often splash water onto the surface and trowel it into the plaster to produce a smoother surface. The downside, of course, is that this troweling also weakens the finished surface. 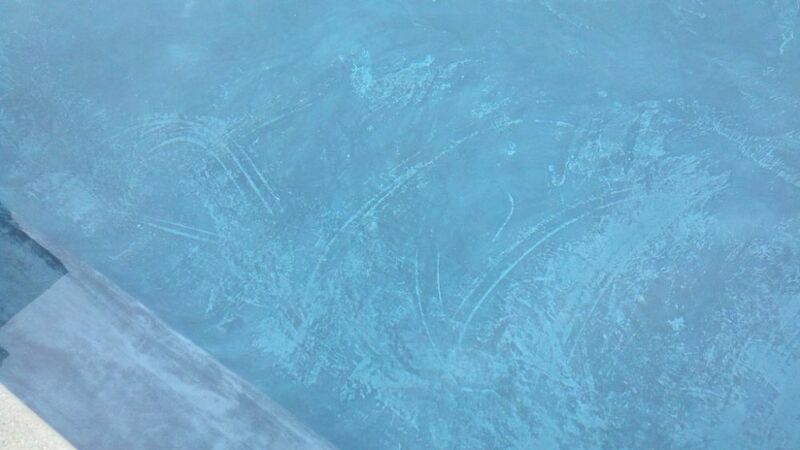 Bottom line: The affected plaster surface will break down and become porous once the pool is filled with water; that porosity leads to discoloration or lightening of a sort well documented by cement scientists. Why are cement/plaster scientists and laboratories so focused on calcium chloride and using the technique of late water troweling? It’s because they lead to what they call white soft spotting (better known among plasterers as “spot etching”). Those two factors, they observe, cause extensive micro-cracking on a plaster surface. Over time, the water in a swimming pool or spa will penetrate these surface imperfections and will dissolve calcium hydroxide (a soluble cement component), thereby creating porous spots and areas below the surface. Eventually, this surface porosity results in the growth of weak areas that become both visible and white over time – and yet may remain smooth to the touch. In most cases, this white spotting and streaking takes hold in just a few months – and it’s as common a problem with white plaster as it is with colored plaster. Studies of the test pools established by the National Plasterers Council at the California State Polytechnic University (Cal Poly) in San Luis Obispo, Calif., support this point, adding the key observation that white spotting developed in some of their balanced water test pools but was not an issue in all test pools with aggressive water. By analogy, it can be noted that rain, which is very aggressive, does not cause white spotting (or darkening) to develop on concrete flatwork or other concrete surfaces as a normal occurrence – an instance in which awareness of research in the greater community of concrete and cement science offers observations made in the world of watershaping. Here’s another example: During the finishing process, a watery and weak cement cream (known as laitance) may develop on the plaster surface. This material is the plasterers equivalent of the rebound that is sometimes a part of the process of applying shotcrete to a shell: As with rebound, the plaster cream should be discarded. If it is left on the surface, it will prevent the color of a quartz or pebble aggregate (if used) from showing; even more important, it produces a weakened surface that will deteriorate sooner than normal and is likely to become unsightly over time. 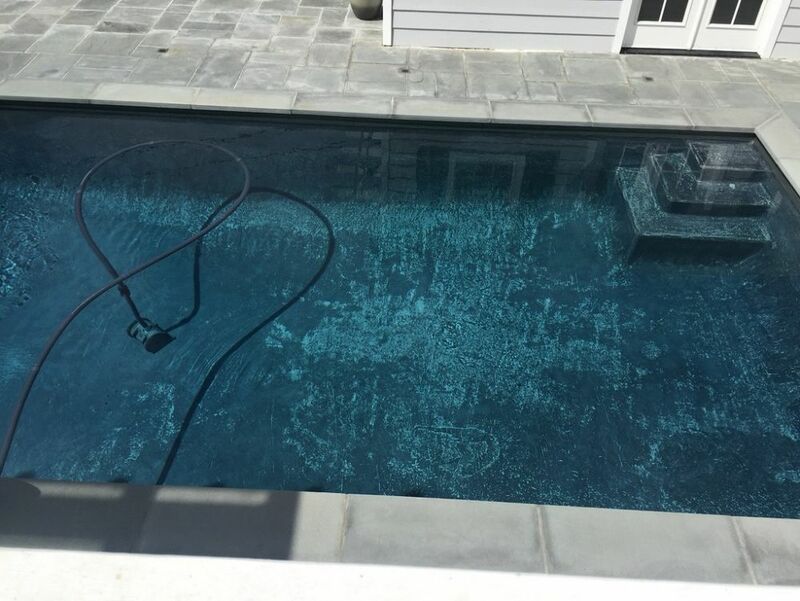 When this happens in colored or white plaster pools, the porous spots and streaks can become very white after only a few months of submersion – even in balanced pool water. Contrary to some opinions, aggressive water chemistry is not the cause of this spotting and streaking on colored or white pool plaster. As was suggested five years ago, tenting a pool can relieve weather-related difficulties on both ends of the scale, protecting the plaster surface as well as the plasterers from the elements. But please note: In areas where high heat is accompanied by high humidity (as in the southeastern United States), the moisture in the air is actually beneficial when it comes to proper curing of pool plaster! 8] Once the pool has been plastered and is finished, the filling of the pool with water should not be started too early. Conditions vary, but as a general rule the water should not be turned on for at least six hours after completion of the finish troweling. This allows the plaster to harden properly before it is submerged in water – a key point because even balanced tap water can dissolve certain components in an insufficiently hardened plaster surface, creating increased porosity and early deterioration. Forever true: Don’t fill the pool with water too soon! A new pool plaster surface is soft and vulnerable to being dissolved, even by balanced water. Though conditions may vary, filling should not be started for at least six or even eight hours after the pool has been plastered and finished. This should be enough time for the plaster to harden properly before being submerged in water. ACI has documented that early submersion in water causes the deterioration of a cement finish. It’s also true that even balanced fill water can dissolve soluble cement components (calcium hydroxide) if the surface has not adequately hardened. The end result is often visible within a few months and involves greater porosity, early deterioration and a whitened discoloration of the affected areas. It also needs to be understood that waiting to fill new plastered pools a few hours is not necessarily the cause of craze cracking in some plaster pools. More likely the cause would be high water content in the plaster mix or wet troweling. As is true of other concrete surfaces, a well-applied plaster finish can withstand many hours of remaining dry without cracking, especially if it is protected under a tent. 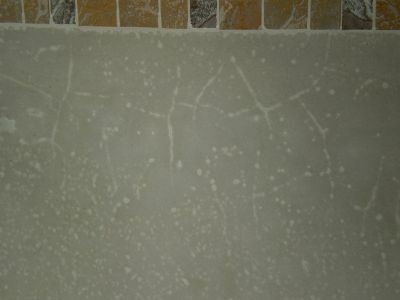 Surfaces can be further damaged by using aggressive (acid) start-up techniques that can increase the amount of uniform surface loss, while baking soda startups will, by contrast, both neutralize aggressive fill water and also promote a superior plaster surface. WaterShapes has recently published a pair of articles on this subject; to see the first article, click here and follow the link at the end to reach the second article. Although now I’d refer to it as a “bicarb start-up” rather than a “baking soda start-up,” our advocacy of using non-aggressive fill water has endured. 10] Once a pool is filled, it‘s best to balance the water and keep it that way. Although this does not serve to “create” long-lasting, durable plaster in the same way the practices listed above will do, balanced water chemistry helps preserve the surface for the long run. Indeed, long experience has shown that aggressive water uniformly etches plaster, while overly saturated water scales it. The Langelier Saturation Index is a good guide: The water should have a saturation index value in the range of -0.3 to +0.5 — a range that does not actively promote either scaling or etching. Again, our recommendations are unchanged and have only become more emphatic as time has passed. The key here is acceptance of the fact that pool plaster fits within the larger, much-better-studied context of the greater scientific community involved in the study of the chemistry and performance of cement and concrete. How our thinking about these materials in the context of pools and other watershapes managed to diverge from these disciplines is beyond me, but it is time to revisit these relationships and bring our thinking into line with precepts offered by ACI, PCA and other established, authoritative entities with skin in the game. When those principles are observed and if the watershape in question is reasonably and consistently maintained, there’s no reason pool plaster shouldn’t have a service life of 20 years rather than the five to ten years now being promoted. It’s an inherently strong, time-tested surface, and it should be able to withstand “real world” chemistry and maintenance challenges. For this pool, the materials and workmanship came together to form a smooth, brilliantly white surface that, once it has sat for at least six hours and then been filled using appropriately non-aggressive water, stands a great chance of looking good for a long, long time. And while it is true that the judicious use of pozzolans and other additives as well as the emergence of cementitious options such as quartz and pebble aggregates are generating good results, the fact of the matter is that all of these materials work best where workmanship standards are high, where there is awareness of the dynamics of temperature and humidity and where everyone involved in the process is dedicated to doing right by both the client and a watershape that eventually will in all likelihood belong to someone else. Today‘s technology provides us with the ability to analyze plaster for most of the abovementioned issues, including such tell-tales as the water-to-cement ratio, the cement-to-aggregate ratio and the calcium chloride content. Technology can also determine whether the surface is more porous than the interior matrix as a result of water additions, and whether the plaster has been etched by aggressive water or has simply deteriorated as a result of its poor quality. In this context, adhering to good plastering practices and standards and then following accepted water-balance practices will eliminate almost all pool plaster problems. Ultimately, pool owners will be happy — and our industry will prosper. Some words don’t need rewriting. Well written article on durable pool plaster. Full of technical guidelines but plain and simple enough for the non-plasterer to comprehend. Just in time for pending re-plaster and patching job ahead.